The fiery light show, which was captured on film and posted online by hundreds of people, is believed to be either a meteor, or a piece of debris from a Chinese satellite. A spokesman for US Strategic Command said it would not provide details until later. Jonathan McDowell, an astronomer at the Harvard-Smithsonian Center for Astrophysics in Massachusetts, said he thought it was space junk from a Chinese rocket launched on 25 June. Mr McDowell said after a month in low orbit, the Long March 7 rocket had burned up as it re-entered the atmosphere. When it was seen from the ground, it was probably about 50 miles above the earth's surface, he said. 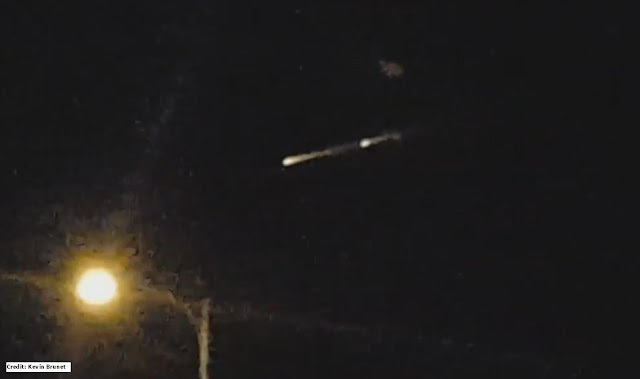 But officials from Nellis Air Force Base in southern Nevada told US media that the light may have been a meteor breaking up. Dr Ed Krupp, director of the Griffith Observatory in Los Angeles, said it could have been from the Delta Aquarids Meteor Shower, which peaked on Wednesday night. Mr McDowell has dismissed the meteor claim, saying they usually move faster, and do not leave a trail of debris. Hundreds of people tweeted photos and videos of the small fiery dot in the sky from northern and southern California as well as Nevada and Utah.